The hydraulic oscillator delivering molten steel for casting molds was operated by 250cc pumps driving a large servo valve. 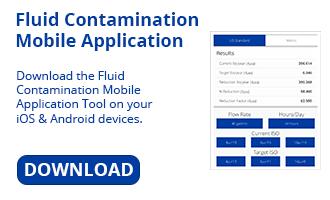 Frequent hydraulic fouling and relatively unreliable operation lead to the assumption that improving fluid cleanliness would improve reliability and productivity. The system was originally fitted with 3 micron glass media elements on pump discharge, servo pilot and return filters plus there was a 1 micron element installed in the off-line filter skid yielding 15/13/8 ISO fluid cleanliness codes. The pump discharge, servo pilot and return elements were upgraded to DFE rated Hy-Pro 3M media B5[c] > 1000 and the off-line skid element was upgraded to Hy-Pro 1M media B2.5[c] > 1000. On-line particle counting was used to verify the before and after ISO codes which dropped with the Hy-Pro upgrades from 15/13/8 to 13/11/6 resulting in a 75% reduction in particles 4m[c] and larger, a 75% reduction in particles 6m[c] and larger and a 74.7% reduction in particles 14m[c] and larger.